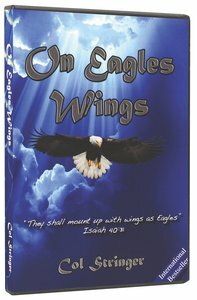 Customer Reviews For "On Eagles Wings"
This is a very engaging and informative teaching dvd on God's references to eagles in The Bible, and invites the viewer into living an 'Eagle Christian' lifestyle. Col Stringer brings great insight and Biblical wisdom to the study of eagles, and relates those characteristics to our Christian walk. It doesn't go for very long, just over half an hour, but it is a highly recommended and very encouraging teaching dvd from a very passionate and enthusiastic Aussie pastor!